November 20, 1968. Seventy-one 1st Marine Aircraft Wing CH-46 Sea Knight helicopters cycled into position as their engines echoed across the Marble Mountain runway. They were airlifting men of the 2nd Battalion, 26th Marine Regiment from ships at sea. 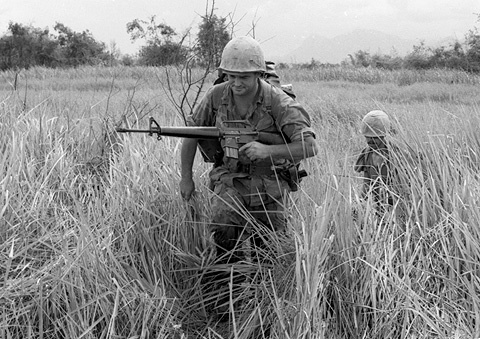 The 1st Marine Division staff planned Operation Meade River in support of the South Vietnamese government’s Accelerated Pacification Program called Le Loi. It would be a cordon-and-search operation led by the 1st Marines. Operation Meade River launched at 4 a.m. with Col. Robert G. Lauffer in command. The 1st Marines Command Chronology reported that intelligence estimated that there were 100-150 Viet Cong and up to 900 regular NVA or VC regular forces. What they did not know was how well prepared the enemy was—and how tenaciously they would fight. As the sun broke through the clouds from the South China Sea, the half-lit shadows of 3,500 Leathernecks could be seen jockeying into position as they filed onboard for the short flight into pre-designated hot landing zones in the Dien Ban area, thirteen miles southwest of Da Nang. This would be the largest helicopter-borne combat operation in Marine Corps history. The first wave of Helicopter Squadron 164 launched Meade River as their CH-46 Sea Knight helicopters lifted into the air and headed west with the men of the 5th Marine Regiment aboard. In the air, radios crackled to life as the squadrons coordinated with each other and the Marines on the ground. The sorties continued for several hours against light resistance as the helicopters positioned all 3,500 Marines into their assigned slots of the cordon operation. Meanwhile, 1,500 more men from seven Marine regiments joined the ARVN and Republic of Korea Marines to encircle main force North Vietnamese regular army units and local Viet Cong insurgents in a tightening cordon—a killing noose of naval gunfire, artillery, aerial attacks, and infantry engagements on the ground. The 1st Battalion, 1st Marines included BLT 2/26; the 2nd and 3rd Battalions, 5th Marines; the 3rd Battalion, 26th Marines; BLT 2/7; and the 1st Battalion, 7th Marines. They formed the cordon clockwise, with two observation towers positioned strategically on the flat open terrain to observe and engage enemy troops. Once the cordon was complete, the first priority was to evacuate civilians living within this no-man’s land that the troops nicknamed Dodge City. 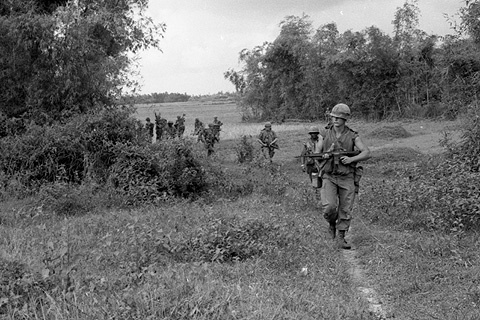 The task of relocating 2,600 civilians to a camp near Hill 55 fell to the ARVN forces. It did not take the enemy long before they responded by shooting down two helicopters and damaging several others. Then a command-detonated mine destroyed a truck, killing a Marine and wounding twenty-three Marines and two ARVN soldiers. These actions foreshadowed what would come in the next nineteen days. Historians point to 1968 as a year of change precipitated by the Vietnam War, which was inflaming protests in the United States and around the globe. One unit, India Company, 3rd Battalion, 26th Marines, would fight its way from Khe Sanh to the rice paddies southwest of Da Nang before the year ended. Capt. Dabney was awarded the Silver Star for his actions on January 20, 1968, on Hill 881 South. This same unit would participate in Operation Meade River eleven months later. Only this time it would be the NVA and VC who would be under siege. One Marine, Staff Sgt. Karl G. Taylor, would be awarded the Medal of Honor for his actions the day before the battle ended. Taylor was on his second tour in Vietnam. “Gunny T,” his fellow Marines called him. Though he was a platoon sergeant, his company commanders often had him fill in as the company gunnery sergeant. Taylor was a bear of a man, heavily muscled and well over six feet tall. “The first time I saw him was at Khe Sanh,” recalled Cpl. Larry Gore. Assigned as an 81mm mortarman, Gore had been filling sandbags at the besieged Khe Sanh combat base when a call went out for a volunteer to go to Hill 881 South. He jumped at the chance. After sunset Taylor came by to check on Gore. “Take care of this Marine,” he said, “He’s like a beaver—he slaps his tail yelling ‘Incoming’ as a warning and dives for cover.” The nickname stuck. The Khe Sanh Siege lasted seventy-seven days and cost the enemy 10,000 killed. Fewer than 500 U.S. Marines were killed in action. The evening news featured images of the beleaguered Marines hunkered down as they drove back wave after wave of enemy troops similar to the battles with the Chinese in Korea in the 1950s. Then, on January 31, 1968 (the Vietnamese lunar New Year), some 70,000 North Vietnamese and Viet Cong forces launched a coordinated series of fierce attacks on more than a hundred cities and towns in South Vietnam: The Tet Offensive. Their goal was to inspire the South Vietnamese people to rebel and unite as one communist nation. U.S. forces and their allies launched operations following Tet to deny the NVA and VC sanctuary in South Vietnam. Meade River would last for nineteen days and would be the final major—and arguably the biggest and most volatile—battle of 1968. The Marines were very familiar with Dodge City, a 14-square-mile area where they had fought many ambushes and firefights. Meade River’s major battles would take place in the two-square-mile center of Dodge City. Just south of Go Noi island was the Vietcong and NVA’s stronghold and base area. The terrain was completely flat and crisscrossed with many small waterways. Here the Vietcong R-20 Battalion and the NVA’s 1st Battalion, 36th Regiment were dug into heavily fortified bunkers and a labyrinth of underground tunnels. Just before noon on November 20, BLT 2/7 began Phase 2 of the operation by sweeping east toward the railroad berm. By 4 p.m., H Company secured the southern end of the battalion’s objective with very little resistance. Just thirty minutes later, however, all hell broke loose when they ran into a heavily armed enemy complex in a hook-shaped bend in the river they called The Horseshoe. Intense fire from what they discovered were combat-hardened NVA regulars forced the Marines to withdraw. Marine air and artillery slammed the enemy defensive positions time and time again for five days. The enemy hunkered down during the barrages and then repeatedly repelled the Marine assaults. The Marines realized that they had trapped a much larger enemy force than anticipated. Despite vigorous psychological initiatives—including dropping thousands of leaflets urging surrender, heavy pummeling by the battleship U.S.S. New Jersey, and continuous artillery barrages—the enemy was determined to fight their way out of the cordon or die fighting. The Marines were forced to dig the enemy out of their holes in close combat, hand to hand and eyeball to eyeball. On November 30 India Company was assigned to secure a crashed CH46 helicopter in imminent danger of being seized by the enemy. Covered by darkness, Cpl. Felipe Torres led the 2nd Platoon through 1,500 meters of open rice paddies to the wreckage. He established a defensive perimeter. As enemy small arms and automatic weapons fire hit around him, Torres moved to pinpoint the enemy positions and direct the fire of his men. Enemy resistance increased as the cordon closed tighter. Cpl. Reid R. Ross, with a Weapons Platoon attached to India/3/26, swept across a flat, open rice paddy on December 4 to locate enemy forces. NVA troops, dug into heavily fortified emplacements, responded with heavy small arms and automatic weapons. Ross raced forward despite heavy enemy fire, rallying his men and making sure that they had ammunition. Unable to deploy his Marines to an alternate location, Ross decided to eliminate the threat himself. He charged through enemy fire, hurling hand grenades and firing light antitank assault weapons at NVA bunkers, but with little effect. Tibbs then ordered a “danger real close” artillery barrage with delayed fuses called in on the bunker complex that had resisted earlier assaults. “Taylor warned us to hold our breath as the fiery napalm rolled in close to us. Then we entered the complex while the NVA were recovering their senses,” Tibbs said. That same evening, Cpl. William C. Wirick’s platoon was crossing a large rice paddy. Suddenly the Marines were hit by enemy automatic weapons and sniper fire. Although seriously wounded during the initial moments of the fierce firefight, Wirick began directing the evacuation of other casualties. Seeing that one of his Marines was wounded and exposed to sniper fire, Wirick threw himself across the Marine’s body and absorbed several sniper rounds. For his selfless concern and personal sacrifice, Wirick was posthumously awarded the Navy Cross. 2d Lt. Chris Tibbs recalls: “All our Marines were on line, 3rd Platoon on the left flank under Lt. Webber, then weapons platoon led by ‘Gunny T’ Taylor. The company CP group was followed by 2nd Platoon with 1st Platoon under Staff Sgt. Williams. My platoon sergeant (replacing Lt. West who was badly wounded by an NVA claymore) and most of the company were on my right while I was guiding on the river. “When we stood up to advance, all firing from the NVA/VC ceased—dead silence. We advanced perhaps thirty meters and a single round was fired and the radio said that India 3’s company operations officer was down. Then everything came apart very quickly. India 6 (Hoover) ordered everyone back to the earlier position. “It was now becoming dark and more difficult to keep track of who we had left and where. I was unable to see anyone to my left until Gunny T came back and asked what we should do. I told him to get all his wounded and head back behind my 2nd Platoon so that we could defend them. Gunny T then moved forward. I believe he met up with Beaver. He then moved out, in true drill-instructor fashion, inviting his Marines to move back and he would cover them. He did so—using his M79 and assaulting two NVA machine-gun positions. Hoover said that it was at this point that Taylor grabbed an M79. Taylor was awarded the Medal of Honor. His citation describes his actions after he was informed that the lead platoon commander had been killed. Taylor and Gore crawled forward of the unit that was pinned down by enemy fire to direct them to covered positions. They repeatedly maneuvered across the open area to rescue those Marines too seriously wounded to move by themselves. When Taylor saw that other seriously wounded men were lying in another open area near a machine-gun position, he and four other Marines attempted to rescue them. But they were stopped by heavy enemy fire, so Taylor told the other Marines to return to the command post. Then he charged forward with his grenade launcher in full view of the enemy, firing as he advanced. Although seriously wounded, he succeeded in silencing two of the three machine-gun positions before he was mortally wounded. The final assault was executed the next day, December 9. Taylor was found on the ground where he fell. A brutal fight ensued in an area about twenty meters square that included hand-to-hand combat against a tenacious enemy that refused to surrender. More than 300 enemy bodies were found on the battlefield, more than one third of the total enemy killed during Meade River. Cpl. Torres, who later retired as a colonel, was the 2nd Platoon sergeant. He and Tibbs sent their three squads to help retrieve the dead and wounded. They worked all night. Time was critical because the enemy also moved forward during the night; any Marine they found wounded and alive was shot in the head. “One or two wounded Marines were able to feign death so they were not shot,” Torres said. Daylight came and the fear and emotions subsided. The Marines knew this day was the end of Meade River. In their eagerness to get ready in the morning, they had overlooked one bunker with occupants. “One of our Marines, who was part Native American and was an excellent tracker and observer, thought he smelled something and had seen movement in a nearby bush,” Torres said. But the battle-hardened men who fought and endured the siege at Khe Sahn proved their mettle against a dedicated enemy. Hoover observed that only two helicopters arrived to lift them out. “It took seven or eight to transport us in,” he said. The final count of enemy casualties was 1,325. More than 360 well-dug entrenched log, railroad-tie, and cement bunkers were destroyed, and many more caved in by bombings. Of the 1,325 confirmed casualties, 1,025 were killed and 300 wounded. Only six enemy troops chose to surrender. 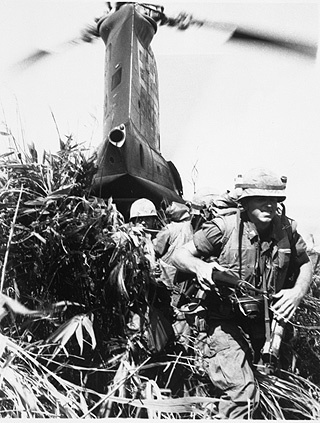 This successful operation was not without cost: 108 Marines were killed and 513 were wounded. Robert Jordan served as a gunnery sergeant and Marine combat correspondent in Vietnam, 1968-69, and participated in Operation Meade River.